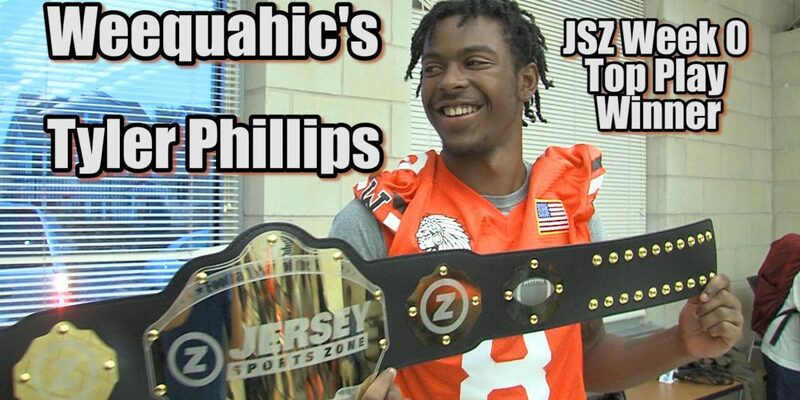 After dazzling Weequahic football fans and then over 2 million viewers around the world, Weequahic High School senior Tyler Phillips captured the first JSZ Top Football Play award this season. Phillips took a botched punt snap on 4th down for 65 yards to the house against Morris Catholic in Week Zero while breaking almost a dozen tackles on the play. The play went viral in under 24 hours and was featured on ESPN’s First Take and social media pages for House of Highlights and Bleacher Report. Winners of each week’s top football play poll will receive a Jersey Sports Zone Football Play of the Week title belt engraved with our logos. A seat at the 2018 All-Zone football banquet comes with winning the poll, too. Make sure to go vote for the Week One Top Football Play now — the polls are still open until Tuesday at 3:00 p.m.